Every physician knows that placebo is a powerful drug. It works! Yet he will never use it since medicine regards it as a fraud. Why should medicine abandon such a valuable drug? Since it does not fit into its theory. According to Dorland's Medical Dictionary the placebo is "any dummy medical treatment; originally, a medicinal preparation having no specific pharmacological activity against the patient's illness. . ." (1). Consider a patient with a chronic disease that requires adrenal steroids or immuno-suppressive agents. Prolonged treatment is accompanied by undesirable side-effects. Several studies have shown that by interleaving placebo tablets in the treatment regimen, the total amount of drug can be reduced (2). Clearly a beneficial placebo effect, which cannot be explained by pharmacology. This example illustrates the real meaning of the term Placebo. A therapeutic effect which cannot be explained medically. In other words Placebo Effect is a phenomenon which medicine does not understand. As medicine advances, placebo effect becomes more conspicuous. In a recent article 'Drugs and Placebos Look Alike in the Brain' (3) The neuroscientist P. Petrovic is quoted: "Placebo activates the same circuits as pain killing drugs." His colleague, P. Rainville, a psycho-neurologist adds, "Placebos harness the same painkilling circuits as do opioid drugs." Using Positron Emission Tomograph (PET) Petrovic et al. showed that "both the genuine analgesic and the placebo led to increased blood flow in areas of the brain known to be rich in opioid receptors." Two kinds of processes operate in disease - 1 -those for which medical theory has an explanation, and 2 - unexplained processes. The first obey physico-chemical laws, and are studied by the medical sciences, e.g., pathology, microbiology and pharmacokinetics. Unexplained processes will be called here "placebo effect". Here are some examples: an infectious disease is treated with antibiotics. The interaction between microbe and antibiotic drug is accounted for by pharmacology and microbiology. It is an explained process and belongs to the first category. All other processes operating in an infectious disease, e.g., inflammation, fever, headache, and prostration, which are not accounted for by the theory of pharmacology, belong to the second category, or "placebo effect". Diseases are mixtures of explained and unexplained (placebo) processes. Treatment directed to explained processes is called "specific". 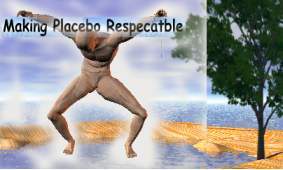 Non-specific treatments mobilize unexplained (or placebo) processes. Suppose now that a patient with influenza was treated with aspirin and gets better. The theory of medicine (here, pharmacology) fails to explain why he gets better. Restated otherwise, aspirin mobilized unexplained processes, or placebo effects. In this context, placebo treatment targets unexplained processes and is therefore non-specific. Hippocrates would attribute such unknown processes to the healing force of nature (4). Unexplained processes intrigued two renowned physiologists, E. H. Starling, and W. B. Cannon. Starling realized that even if all physiological processes in the body were understood, we still could not explain how they are controlled. This knowledge he attributed to the wisdom of the body (WOB). This was also the title of Cannon's physiology book, which introduced the notion of homeostasis (5). WOB accounts for all processes operating in the body, explained and unexplained (6). More precisely, WOB is the set of processes operating in the body. Some are explained by the medical theory and others are unexplained (placebo). In order to be able to study placebo effect scientifically, medicine has to widen its theory. Otherwise placebo will always remain unexplained. Medicine is essentially a linear science which likens the organism to a complex machine. Yet our organism is more than that. 1. It is (extremely) complex. 'Fully connected' means that all components interact. The major communication channel between cells is the extra-cellular fluid, carrying hormones, factors, vitamins, etc. Then comes the vascular system. Finally the nervous system, which carries two kinds of message. Electrical signals are distributed along axon surfaces , and trophic factors are carried as axoplasmic flow. Actually all cells produce electrical signals which originate in cell membranes. In epithelia they are distributed through gap junctions. Electrical signals are conspicuous in the heart (sinus node), and intestines (myenteric plexus).These examples ought to convince the reader that all constituents of the body interact. 1. WOB is the set of processes in the body. 2. All processes interact (WOB is fully connected). 4. WOB (configuration) is optimal. The four principles provide a basis for a new kind of medical interpretation, called Non-Linear (Chaotic) medicine, which will explain scientifically and rigorously the placebo effect. 1. Dorland's Medical Dictionary (27th Edition); WB Saunders Co, Philadelphia, 1988. 2 Nader R. The role of conditioning in pharmacotherapy. In "The Placebo Effect" (A Harrington ed. ); Harvard University Press, Cambridge, 1997. 3. Holden C. Drugs and Placebos Look Alike in the Brain. Science 295: 947,2002. 4. Zajicek G. Healing force of nature. Cancer J 8, 4-5,1995. 5. Cannon WB. "The Wisdom of the Body". Norton, New York, 1932.